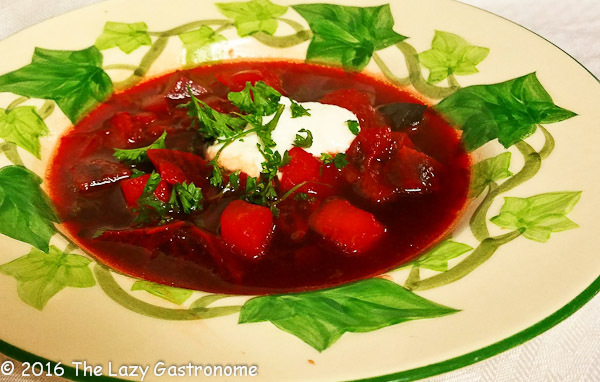 I’ve seen borsht made as a rich broth with chunks of beets and potatoes, and I’ve seen it creamy and smooth -served hot and cold. 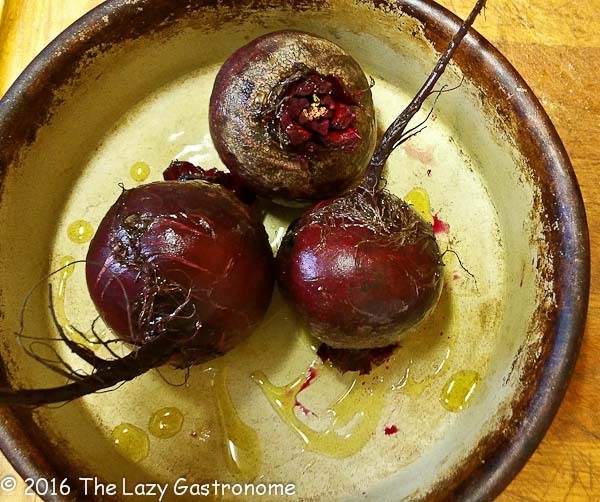 Which ever way you do it, this recipe is easy and tasty!! The two of us ate the whole pot! Wash them and remove the greens (but don’t throw them away – you can sauté them and eat them like spinach!). Drizzle 2 Tablespoons of olive oil over them and roast at 350 degrees for about 20 – 25 minutes, until they are fork tender. Remove them from the oven and allow to cool completely. You can remove the skin by running them under cold water and gently rubbing until it all comes off. Any that won’t can be carefully removed with a knife. 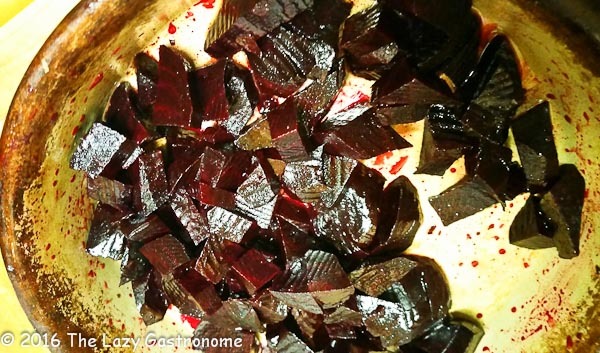 Cut the beets into ½ inch cubes. I like to cut them in the pan to make sure I can recover any juices that come out during the cutting. Using a medium kettle or large saucepan, sauté the onions in 2 Tablespoons of olive oil until they are starting to soften. Add the broth, potato, salt and pepper and simmer about 45 minutes to an hour, until the broth is bright red and the vegetables are tender. Add the pepper and the vinegar. Serve hot or cold. 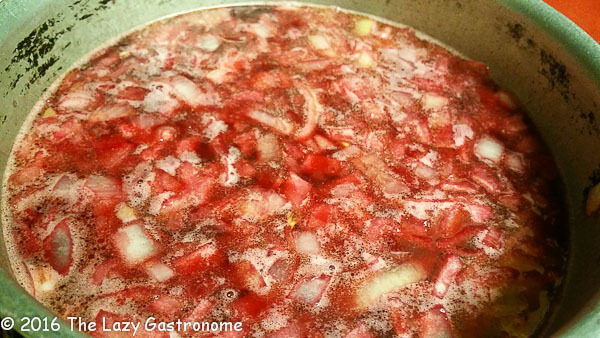 Often the cold borsht is pureed before chilling. To do this, just put it in a blender and whirl! Top with a dollop of the sour cream/horseradish mixture and sprinkle with parsley. 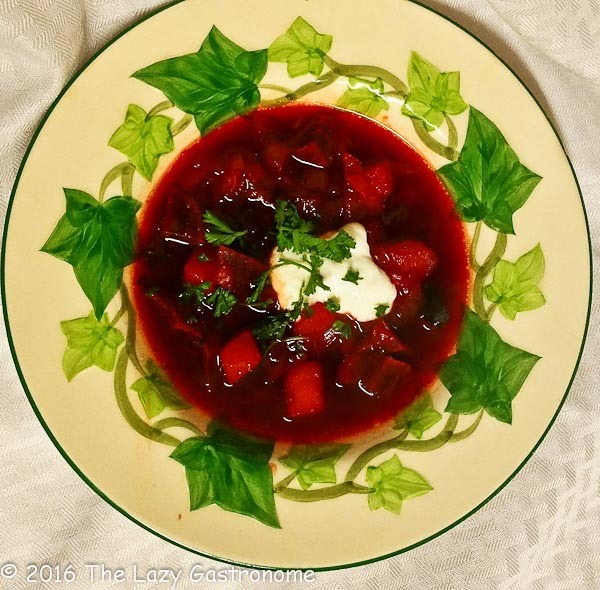 This entry was posted in Beets, Side Dish, Soup and tagged beets, borsht, cold soup, Russian, soup. Bookmark the permalink. Mmm. 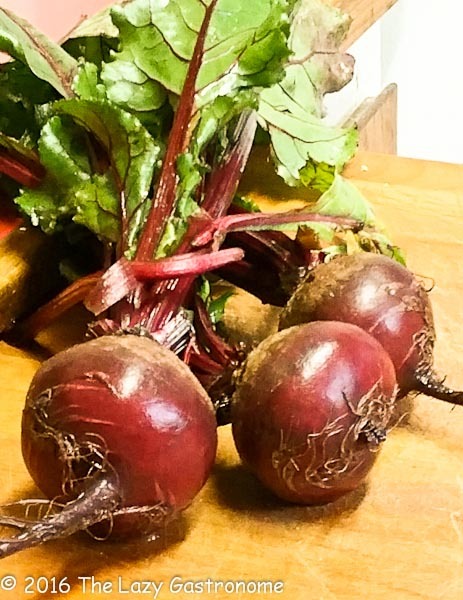 Once my beets are ready to be harvested this sounds fabulous. Thanks for sharing on the Creative K Kids Tasty Tuesdays Linky Party. I hope you will join us again next week. 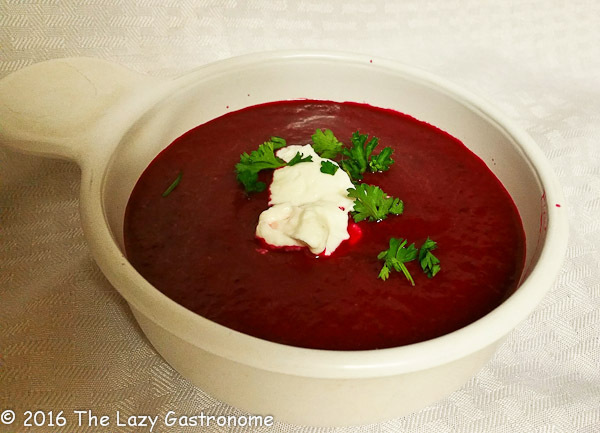 I’m a big fan of borsht, this looks so good, I like it both chunky and pureed, yum! Thanks for sharing at What’d You Do This Weekend? !